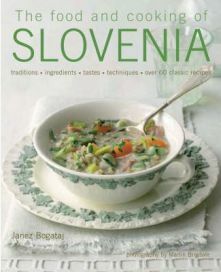 Janez Bogataj’s The Food and Cooking of Slovenia has the look and feel of a fairytale book and, looking at the beautiful photographs and reading the names of some of the dishes, you might be forgiven for thinking there’s something almost other worldly here. Famed for its beautiful mountain scenery, myriad castles and picturesque medieval towns rather than its cuisine, Slovenia is not a country that springs to mind when talking about the great culinary traditions of Europe. It does borrow fairly heavily from its neighbours – in the western part of the country in particular pizza is very good, while most restaurants in the east will rustle up a hearty gulasch – but there is a strong gastronomic tradition if you know where to go and seek it out.